Sega announced Sonic and the Black Knight, a Wii exclusive game that would be released. The game will make use of both the Wii Remote and Nunchuk rather than the horizontal Wii Remote used in the wii-exclusive Sonic and the Secret Rings. 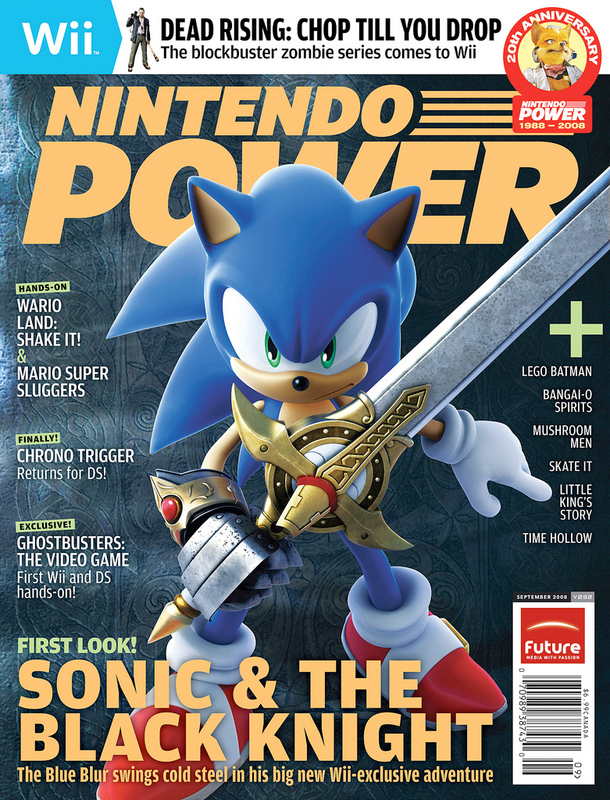 The game will switch between between 2D and 3D perspectives and the game will take sonic to a medieval world where sonics is is armed him with a sword to aid in his effort to save the day. Sonic will appear in the Samba-inspired rhythm music game that was made popular in arcades and on the Dreamcast, Sambe De Amigo. This entry was posted on Monday, July 28th, 2008 at 2:51 pm and is filed under Nintendo. You can follow any responses to this entry through the RSS 2.0 feed. You can leave a response, or trackback from your own site. I was just searching for this info for a while. After six hours of continuous Googleing, at last I got it in your website. I wonder what’s the lack of Google strategy that don’t rank this kind of informative websites in top of the list. Generally the top web sites are full of garbage. I was recommended this web site by my cousin. I am now not positive whether or not this publish is written by means of him as nobody else understand such specified about my problem. You are amazing! Thank you! F*ckin’ awesome things here. I’m very glad to see your post. Thanks a lot and i’m looking forward to contact you. Will you please drop me a e-mail? I am typically to blogging and i really admire your content. The article has actually peaks my interest. I am going to bookmark your site and maintain checking for brand spanking new information. I’m noneffervescent learning from you, but I’m trying to achieve my goals. I perfectly copulate measure all that is posted on your place.Fastness the tips coming. I enjoyed it! One other important aspect is that if you are an older person, travel insurance with regard to pensioners is something you ought to really take into consideration. The elderly you are, the more at risk you might be for permitting something negative happen to you while in another country. If you are certainly not covered by some comprehensive insurance coverage, you could have some serious challenges. Thanks for giving your guidelines on this blog site. I actually wanted to construct a brief message to be able to express gratitude to you for the fantastic secrets you are placing at this website. My time intensive internet search has at the end been rewarded with sensible ideas to share with my classmates and friends. I ‘d tell you that many of us visitors actually are quite lucky to dwell in a useful site with very many marvellous people with beneficial advice. I feel really privileged to have come across the webpage and look forward to so many more awesome times reading here. Thanks a lot once again for everything. Thank you for the sensible critique. Me and my neighbor were just preparing to do a little research on this. We grabbed a book from our local library but I think I learned more from this post. I am very glad to see such excellent info being shared freely out there..
can advise? I get so much lately it’s driving me mad so any help is very much appreciated. some minor security issues with my latest site and I would like to find something more risk-free. Good post. I study one thing more difficult on totally different blogs everyday. It’ll all the time be stimulating to learn content material from other writers and apply slightly something from their store. I’d choose to use some with the content on my blog whether or not you don’t mind. Natually I’ll give you a hyperlink on your internet blog. Thanks for sharing. without my permission. Do you know any ways to help reduce content from being stolen? Wonderful article! This is the type of information that are meant to be shared around the net. I definitely liked every part of it and i also have you book-marked to look at new information on your website. be actually one thing which I think I would by no means understand. the benchmark for quality workmanship and customer service. There is certainly a great deal to know about this topic. I love all the points you’ve made. An outstanding share! I’ve just forwarded this onto a friend who had been conducting a little research on this. And he in fact ordered me lunch due to the fact that I discovered it for him… lol. So allow me to reword this…. Thank YOU for the meal!! But yeah, thanks for spending some time to discuss this matter here on your blog.